My summertime baby is almost here: although Eric needs to stay safe inside of me for a couple more weeks at least, I know that we are now in the period during which he could come at any time. He will be my Summer Boy; I often call Katie my "Pumpkin Girl" or "Pumpkin Baby" since she was born in the cozy fall and so near to Halloween. This summer is whooshing by, and I have tried to make it as memorable and magical as I can for both myself and my daughter. This is the last time I will have with her on our own, and it has been the two of us for so long that that realization is not without poignancy. I so much want to nurture our memories together and to take this last handful of days to make more, so that she has a firm basis in knowing how loved she is (and has been) as she enters the period of having to share her parents with her brother. I have loved this summer. For the past month, I usually start every day working with my hands and centering my mind and heart in meditation. I finished my cross stitch in the early morning light, and lately I have been working on finishing my small quilt (which I will do after I write this entry and which has, at most, an hour's worth of work left). I love waking early; in fact, I've been having a little issue with staying in bed long enough. Life has so much to offer that sometimes it is tiresome to sleep. In another month or two, I know I will be begging for sleep though! This has also been the summer of swimming and sunshine. After Toastmasters yesterday, I took Katie for a swim at our clubhouse pool (we've finished now with our lessons). The water was a perfect temperature, the sun felt good on our neck and faces, and we spent an hour practicing our kicks in the big pool and then pretending to be mermaids in the toddler pool. It was a perfect summer moment. When we got home, we finished planting our vegetable, fruit, and herb garden. My dad made a big garden box for us a week or so ago. I hope our garden thrives as much as his does. We planted tomatoes, corn, a pepper, oregano, basil, rosemary, sage, strawberries, a watermelon, and some flowers Katie chose. After a swim, the dirt and sun and sweat felt equally good. It's funny: I planted a garden at our previous home when I was pregnant with Katie, too, now that I think about it. It has also been the summer of blueberries. I am more sad that their season has officially ended this year than I have been any other year. My mom first discovered the farm that first summer after Katie's birth, and so I attach the growth of my daughter to our yearly visits. She was still such a baby when we first went picking. And now she is playing on the farm's red tractor! A couple of days ago, Katie and Boppa and I went to a local park (Harveston) to take pictures for the press release of the new slate Toastmasters officers (I am the VP of Public Relations). It was a beautiful afternoon and Katie played on the lawn nearby. My dad and I continue to enjoy our father-daughter time every Tuesday at Toastmasters. My dad led the meeting yesterday, with the theme of "caring for and nurturing freedom." He came well-prepared and kept the meeting moving along---he did a great job! This time with him has been special, and we have been members now for almost a year together. 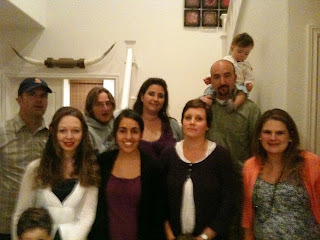 Last Thursday, I attended a mini-reunion with some of my CSUSM teaching credential cohort classmates. It has been SEVEN years since we took our teaching courses! What? Back then, only a couple of us had children, and now our families are thriving. We didn't have nearly everyone from the program, but I have always loved this core group of people who came. Sanam was such a welcoming hostess. We had a delicious dinner as all the kids played and ran around. Bill came along and helped watch Katie so I could visit. This group has always had such positive, good energy---as I guess we would expect teachers might. Seeing them again reminded me why my year in that program was one of the best in my life, and it also reminded me why there are moments when I miss being in the classroom. They are such good people and just as humorous as they always were. I will never get tired of laughing with them! Also this week, my mom finished Eric's valance! I didn't really get a close enough picture of it...it is blue with a trim of green and white checked fabric. It makes the window feel more cozy! And finally, here is a picture of Eric and me taken yesterday. I just love being pregnant so much. Part of me doesn't want it to end because I know this is our last one. What a good phase of life this has been. I hope everyone is finding and creating joy this summer. I know this particular post has been a little hodge-podgey, but we've been doing many things that didn't quite fit into any other post I've written lately. I am continually thankful that life is so full, and so full of light and beauty.